Go back in time to the pomp and pageantry of medieval royalty with this 5 reel online slot extravaganza! 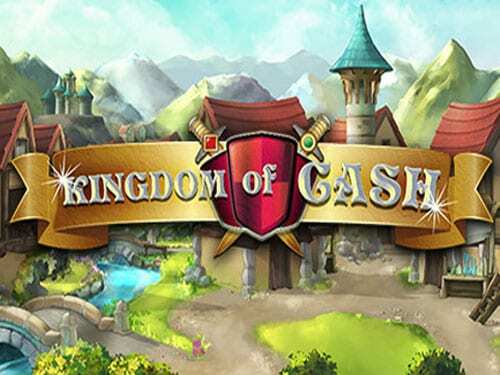 Kingdom of Cash is a fun and quirky 25 payline that will encapsulate you with its cartoonish aesthetic. Still ooking for other games? Find online video slots here now. Eyecon online play slots are fast becoming one of the leading developers on the market because of their online slot games that have not only great appearances but extremely enjoyable bonus games that help the gamer create strong and long-lasting relationships with the brand. 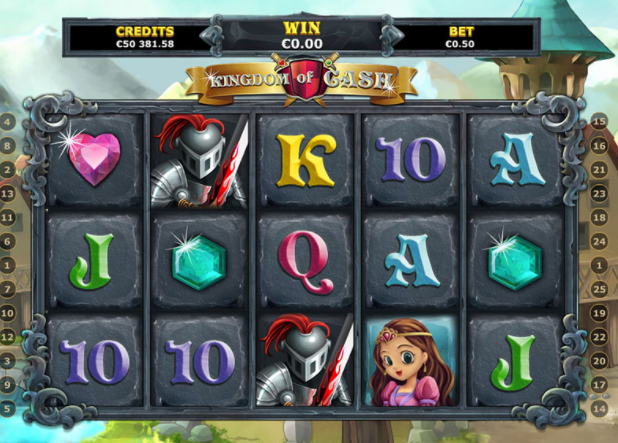 Kingdom of Cash casino slot games transports you back to a medieval world filled with Knights and Damsels in distress. It’s the standard Eyecon set up with 5 reels, 3 rows and 25 paylines that are just desperate to be spun. Join the knights and peruse the city limits of your royal kingdom and nurture your peasant inhabitants before battle commences. If you’ve ever seen any medieval films or even Robin Hood then you’ll be familiar with the type of soundtrack that this game possesses. The sound of drunken men playing the lute. Despite Kingdom of Cash’ lack of originality on the theme front, it’s still one of the best looking medieval online slots about. Have you tried to play our top 10 best slots, including this game? The 25 payline structure gives the opportunity to the gamer to win a healthy profit. As per the standard rules of online gaming, the lowest stake you can put down is a slender 1 penny. However, if you’re feeling lucky and that you have the wealth of the kingdom behind you then the maximum bet that you can place is a whopping £60. If you are looking to bet big, please take care to check your deposit limits and gamble responsibly. As mentioned above you can’t fault the aesthetics of this game, it really does stand out from the rest of the games that fall into the fantasy genre. If you look past the stone game board you will see a large settlement full of peasants, livestock, and the general goings on of a medieval township. In terms of the reels, there are lots for the eye to absorb. Spin your way through wizards, kings, knights and princesses to obtain the higher value symbols. As expected the lower valued symbols are always the numbers and letters. The Kingdom of Cash has many features that can be enjoyed. Stumble across the lucrative princess character on reels 3, 4, and 5 and the princess scatter will trigger up to 25 free spins. In a similar fashion, if you’re looking to get the adrenaline pumping then you can also experience the might of the gamble feature. You must select the correct two options to double your winnings, however, if you fail then you will lose it all. Keep your sword in its sheath for this round because you don’t want to be falling on your own. Once you've finished playing slot then how about try a game of txs hold em?